Vasily Ivanovich Chuikov (12 February 1900 – 18 March 1982) was a Soviet military officer. He was the commander of the 62nd Army during the Battle of Stalingrad. Following World War II, Chuikov was Chief of the Group of Soviet Forces in Germany (1949–53), commander of the Kiev Military District (1953–60), Chief of the Soviet Armed Forces and Deputy Minister of Defense (1960–64), and head of the Soviet Civil Defense Forces (1961–72). Chuikov was twice awarded the titles Hero of the Soviet Union (1944 and 1945) and was awarded the Distinguished Service Cross by the United States for his actions during the Battle of Stalingrad. In 1955, he was named a Marshal of the Soviet Union. Following his death in 1982, he was interred at the Stalingrad Memorial at the base of the Mamayev Hill, which had been the site of heavy fighting. Born into a peasant family in the village of Serebryanye Prudy in the Tula region south of Moscow, Chuikov was the eighth of 12 children and the fifth of eight sons. 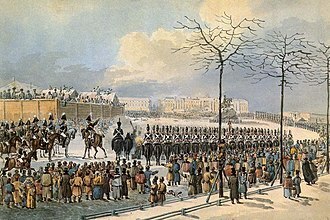 At the age of 12, he left school and his family home to earn his living in a factory in Saint Petersburg, turning out spurs for cavalry officers. Chuikov and all his brothers became soldiers and fought in the Russian Civil War. 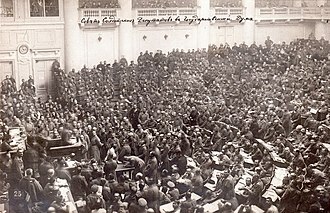 During the turmoil of the Russian Revolution of 1917, Chuikov became unemployed. Later the same year, an older brother arranged for Chuikov to be recruited into the Red Guards. 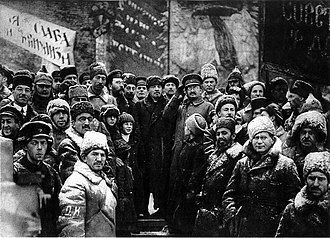 The year after, in 1918, he joined the Red Army. 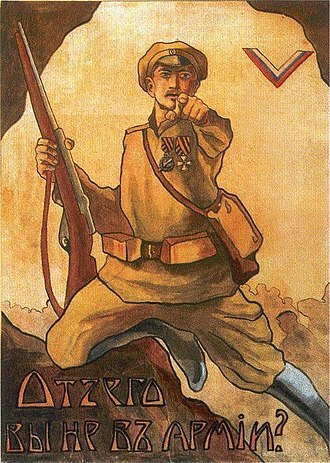 In October 1918, Chuikov saw active service when he was sent to the Southern Front as a deputy company commander to fight against the White Army. 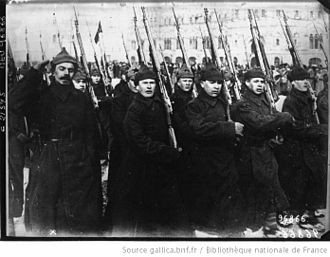 In the spring of 1919, he became commander of the 40th Regiment (later renamed the 43rd), part of the 5th Army under Tukhachevsky facing the White Army under Kolchak in Siberia. Chuikov's record of service during the Civil War was distinguished. 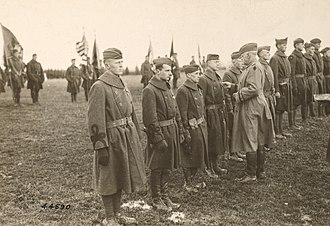 In the fighting from 1919 to 1920 he received two awards of the Order of the Red Banner for bravery and heroism. He was wounded four times—one, in Poland in 1920, left a fragment in his left arm that could not be operated on. It led to partial paralysis and caused him to lose temporary use of his arm. Chuikov carried this war wound for the rest of his life, and it eventually led to septicaemia breaking out in 1981, causing a nine-month illness and finally his death. He left his regiment in 1921 to continue his studies at the Frunze Military Academy, from which he graduated in 1925. 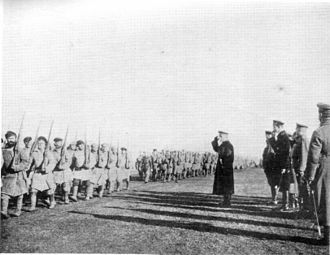 On account of his excellent academic performance, Chuikov was invited to stay at the Frunze Military Academy for another year to study Chinese language and history in the Orient Studies Department. 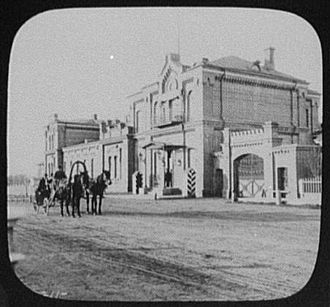 In the fall of 1926, Chuikov joined a Soviet diplomatic delegation that toured Harbin, Changchun, Port Arthur, Dalian, Tianjin and Beijing, cities in northeastern and northern China. After completing his studies in the fall of 1927, Chuikov was dispatched to China as a military attaché. 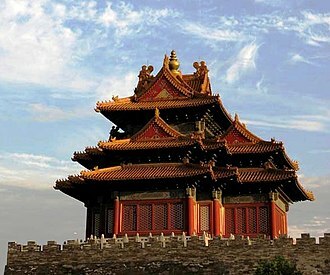 Chuikov traveled extensively in southern China and Sichuan, became fluent in Chinese, and gained a deeper understanding of Chinese politics and culture. 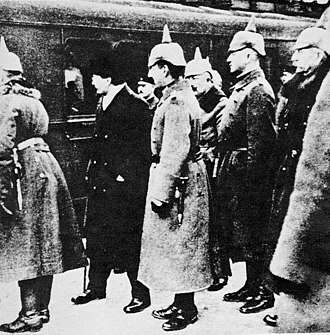 In 1929, during the China Eastern Railway Incident, Chuikov was forced to leave China after the Soviet Union broke diplomatic relations with the Republic of China on July 13. 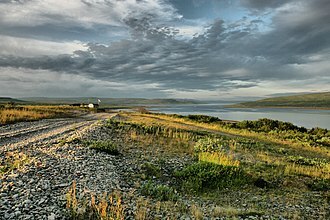 Chuikov was assigned to the newly-formed Special Red Banner Far Eastern Army in Khabarovsk and worked on military intelligence, reporting to Vasily Blyukher, the commander of the Far Eastern Army. 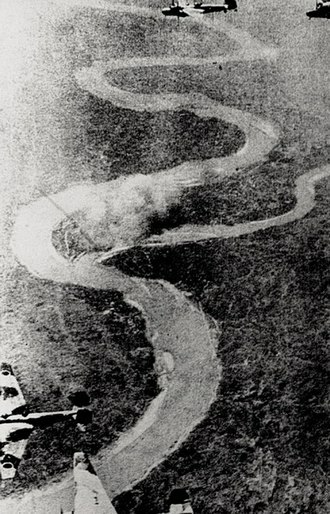 The Soviet Far Eastern Army defeated the Northeastern Army of Zhang Xueliang, and Chuikov participated in negotiations that restored Soviet control of the China Eastern Railway. Chuikov commanded the 4th Army in the Soviet invasion of Poland in 1939. 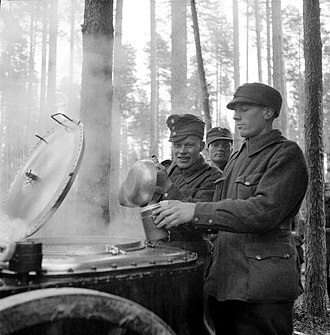 He commanded the 9th Army in the Russo-Finnish War of 1940. 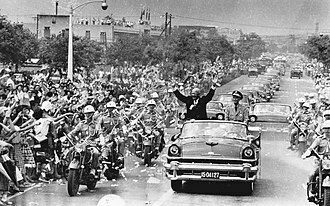 He was then sent to China as an adviser to Chiang Kai-shek. In May 1942, the USSR recalled him. 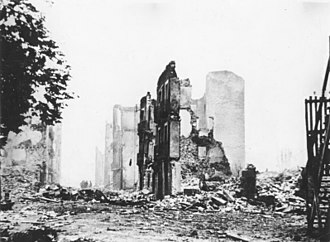 According to Chuikov's memoirs, his recall was due to Nationalist China claiming that the USSR was providing military aid as part of an attempt to draw the USSR into the Second Sino-Japanese War. 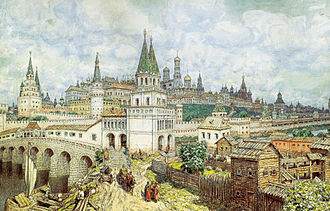 On returning to Moscow, Chuikov was placed in command of the 64th Army (later 7th Guards), on the west bank of the Don River. 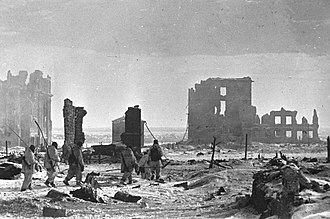 The 64th Army took part in the fighting withdrawal to Stalingrad, and shortly before the Battle of Stalingrad itself began, Chuikov was made commanding general of the more important weak 62nd Army, which was to hold Stalingrad itself, with the 64th on its southern flank. 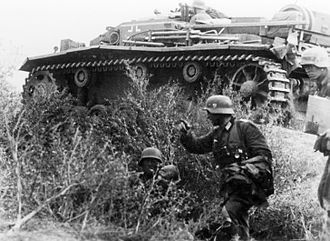 It was at Stalingrad that Chuikov developed the important tactic of "hugging the enemy", by which Soviet soldiers kept the German army so close to them as to minimize the airpower enjoyed by the Wehrmacht. 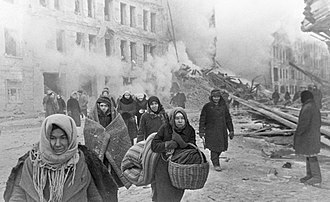 Chuikov had witnessed firsthand the blitzkrieg tactics the Wehrmacht had used to sweep across the Russian steppe, so he used the Germans' carpet-bombing of the city to draw panzer units into the rubble and chaos, where their progress was impeded. 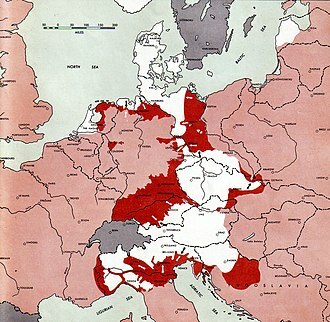 Here they could be destroyed with Molotov cocktails, Antitank Rifles, and Soviet artillery operating at close range. 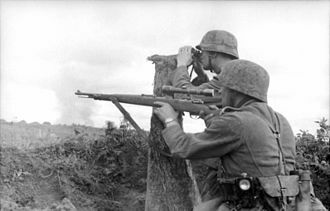 This tactic also rendered the German Luftwaffe ineffective, since Stuka dive-bombers could not attack Red Army positions without endangering their own forces. 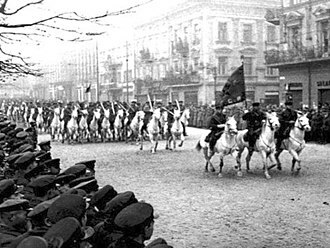 After the victory at Stalingrad, the 62nd Army was redesignated the Soviet 8th Guards Army. 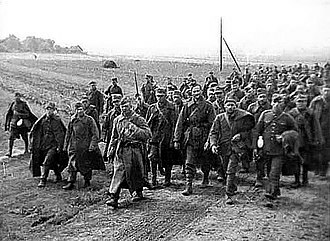 Chuikov then commanded the 8th Guards as part of 1st Belorussian Front and led its advance through Poland, finally heading the Soviet offensive which conquered Berlin while the Allied forces were wiping out what was left in Southern and Western Germany in April/May 1945. 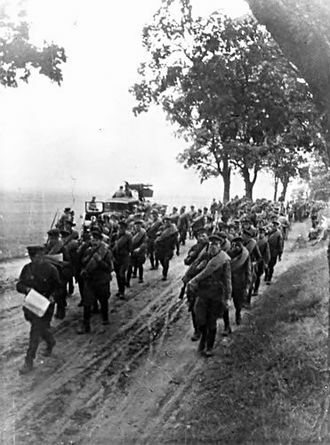 Chuikov's advance through Poland was characterized by massive advances across difficult terrain (on several occasions, the 8th Guards Army advanced over 40 miles (64 km) in a single day). 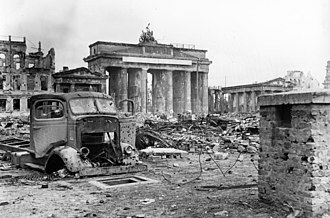 On 1 May 1945, Chuikov, who commanded his army operating in central Berlin, was the first Allied officer to learn about Adolf Hitler's suicide, being informed by General Hans Krebs who had come to Chuikov's headquarters under a white flag. 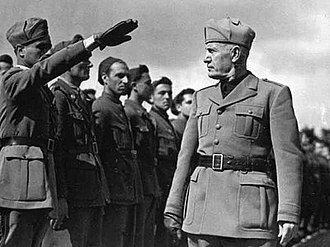 He accepted the surrender of Berlin's forces from General Helmuth Weidling. 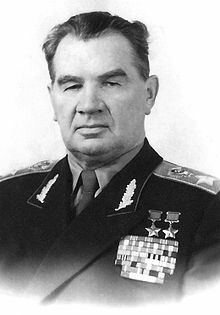 After the war, Chuikov continued to command the 8th Guards Army in Germany, later serving as Commander-in-Chief of the Group of Soviet Forces in Germany from 1949 until 1953, when he was made commander of the Kiev Military District. While serving at that post, on 11 March 1955 he was promoted to Marshal of the Soviet Union. 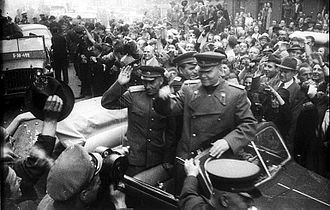 From 1960 to 1964, he was the Commander-in-Chief of the Soviet Ground Forces. He also served as the Chief of the Civil Defense from 1961 until his retirement in 1972. From 1961 until his death, he was a member of the Central Committee of the Communist Party of the Soviet Union. Chuikov, Vasili (2003). Mission to China: Memoirs of a Soviet Military Adviser to Chiang Kaishek. Translated by Barrett, David P. Eastbridge. ISBN 978-1-891936-10-4. 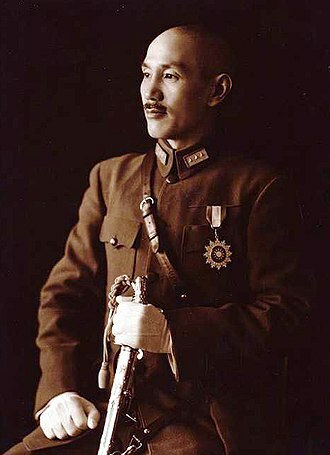 ^ a b c d e 中东路事件孙中山苏联顾问率苏军大败张学良 [Soviet Advisor to Sun Yat-sen lead Soviet Military of defeat Zhang Xueliang]. China.com (in Chinese). 24 May 2013 . 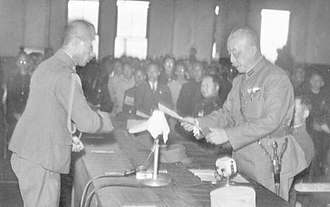 ^ a b 苏联二战名将曾警告蒋介石反内战 结交中共将领 [Famous Soviet World War II General Warned Chiang Kai-shek Against Civil War, Met Chinese Communist Commanders]. 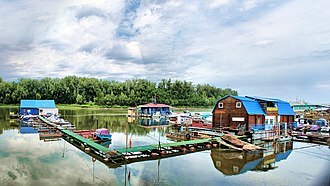 Chinanews.com (in Chinese). 30 April 2015. (in Russian) Memoirs by Vasili Chuikov: Сражение века Battle of the Century – Describes his experiences during the Battle of Stalingrad. (in Russian) Memoirs by Vasili Chuikov: Конец третьего рейха The End of the Third Reich – Describes his experiences during the last months of the war, ending with the Battle of Berlin. 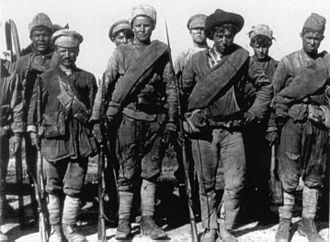 (in Russian) Biography on the website dedicated to the Heroes of the Soviet Union/Russia. 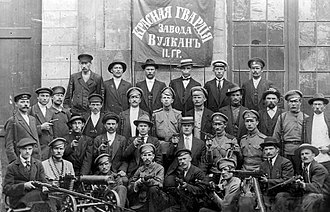 The title Hero of the Soviet Union was the highest distinction in the Soviet Union, awarded personally or collectively for heroic feats in service to the Soviet state and society. 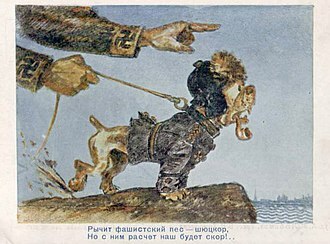 The award was established on May 5,1934, by the Central Executive Committee of the Soviet Union, earlier heroes were retroactively eligible for these items. 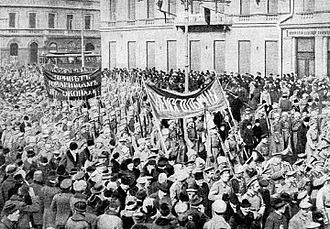 A hero could be awarded the title again for a subsequent heroic feat with an additional Gold Star medal, an additional Order of Lenin was not given until 1973. The practice of awarding the title multiple times was abolished by the Supreme Soviet of the USSR in 1988 during perestroika,44 foreign citizens were awarded the title. The title was given posthumously, though often without the actual Gold Star medal given. The title could be revoked only by the Presidium of the Supreme Soviet, the total number of people who were awarded this title is 12,755. 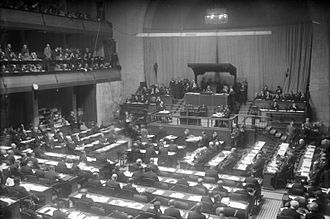 The great majority of them received it during World War II, sixty-five people were awarded the title for actions related to the Soviet-Afghan War, which lasted from 1979 until 1989. Valentina Grizodubova, a pilot, was the first woman to become a Hero of the Soviet Union for her international womens record for a straight-line distance flight. Zoya Kosmodemyanskaya, a Soviet partisan, was the first woman to become a Hero of the Soviet Union during World War II, in addition,101 people received the award twice. A second award entitled the recipient to have a bronze bust of his or her likeness with an inscription erected in his or her hometown. Two famous Soviet fighter pilots, Aleksandr Pokryshkin and Ivan Kozhedub were three times Heroes of the Soviet Union. 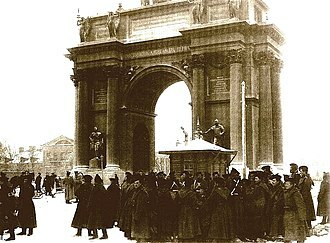 A third award entitled the recipient to have his/her bronze bust erected on a pedestal in Moscow, near the Palace of the Soviets. The only individuals to receive the four times were Marshal Georgy Zhukov. 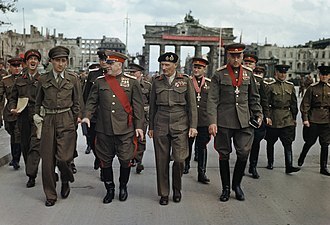 The original statute of the Hero of the Soviet Union, did not provide for a fourth title, both Zhukov and Brezhnev received their fourth titles under controversial circumstances contrary to the statute, which remained largely unchanged until the award was abolished in 1991. Commemorative medal, Group of Soviet Forces in Germany 1945 - 1994.